Despite not having as lofty a record as in past seasons the Vanderbilt Commodores did enough down the stretch to reach the NCAA Baseball Tournament for the 13th consecutive year. 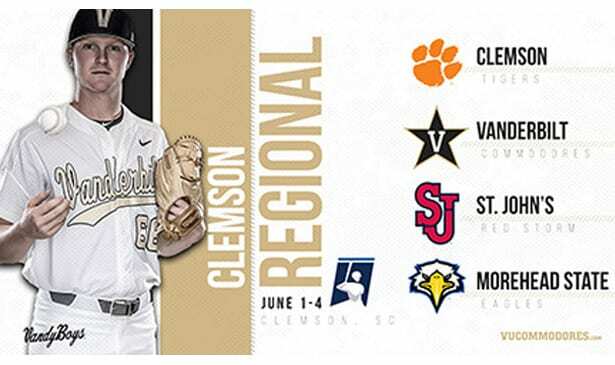 It was almost an exact parallel to last season as it was announced Monday that Vanderbilt would again be the number two seed in the Clemson Regional, and once more face St. John’s. The other team in that draw is Morehead State. Vandy will play St. John’s in the opener. They defeated them last year, beat Clemson two of three, and made it to the Corvalis Super Regional. There they were defeated by Oregon State. Vanderbilt ended the season 31-25 overall, 16-14 in the SEC, but swept Kentucky at home to follow up on taking two of three from UT and blowing out MTSU. It is also the second straight year they open NCAA play on the road after being a host team for four consecutive years. This time the Clemson Regional is paired with the Tallahassee Regional, which includes Florida State, Mississippi State, Oklahoma and Samford. The Commodores’ sweep cost Kentucky an NCAA bid. Vandy had the nation’s fourth toughest schedule and ended with an RPI of 38 and a winning record (18-17) against Top 50 schools. Only Arkansas, Auburn, Florida, Florida State and Ole Miss had more Top 50 wins and all of them are hosting regionals except Auburn. Another host school, Texas Tech, also has 18 Top 50 wins. The schedule and Top 50 record, coupled with the loss of their best hitter J.J. Bleday (.374 average for the games he did play) for 23 games and seven SEC weekend series also factored into the bid. Vandy was 23-10 with Bleday in the lineup, 8-15 otherwise. Despite a 30 RPI Kentucky was not among the 10 SEC teams selected. Others picked were Texas A&M, who defeated Vandy in the SEC Tournament opener, LSU, Mississippi State and South Carolina.